We are the publishers of The Historical Catalogue Series, a collection of professionally reprinted silver flatware and hollowware catalogues from 1888 to 1910. 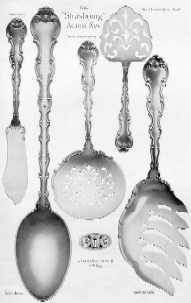 The most recent addition to the series is the 1898 Gorham Strasbourg Catalogue Reprint, which illustrates 116 different pieces including the asparagus tongs, cheese server, bon bon scoop, chocolate muddler, fish fork, orange spoon, horse radish spoon and ice tongs. Are you trying to identify an American Silver Mark? Check out the Online Encyclopedia of American Silver Marks. This is the largest collection of American silver marks on the internet.